Another high-ranking Homeland Security official is leaving the department, having accepted a job as the Pentagon's chief spokesperson, according to sources familiar with the negotiations. Jonathan Rath Hoffman served as the assistant secretary for public affairs at the Department of Homeland Security. Over the weekend, he was offered a new role as assistant to the secretary of Defense for public affairs -- a post that has been filled by an "acting" spokesperson since the previous official, Dana White, departed shorty after Defense Secretary James Mattis resigned in December. The briefing room at the Pentagon in Arlington, Va., Jan. 3, 2002. Sources familiar with the negotiation told ABC News that Hoffman had been looking to leave DHS prior to outgoing Secretary Kirstjen Nielsen's departure earlier this month, but the exodus of several high-level DHS officials expedited his decision making. White last briefed on camera from the Pentagon briefing room over 300 days ago in late May. In November, Mattis selected a Marine Corps general to take over responsibilities at the podium, but the general stepped aside after Mattis resigned, never actually briefing press. 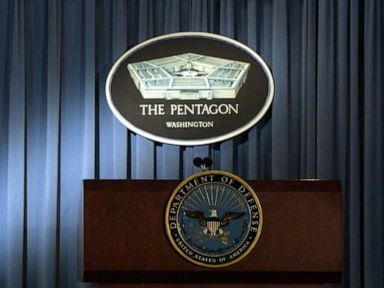 Lt. Col. Joe Buccino, spokesperson for acting Defense Secretary Patrick Shanahan, said, "Secretary Shanahan is committed to turning the cameras back on in the Pentagon press briefing room." Hoffman has served in several roles at DHS and also as the director of International Programs and Border Security Policy at the White House Homeland Security Council. He's also a major in the Air Force Reserve Judge Advocate General Corps, according to his DHS biography.